Sixty years later, the Marshall Islands still bears the marks of the Operation Castle tests – of which Castle Bravo was the first and largest. Bravo more than doubled its predicted yield of about 6 megatons. 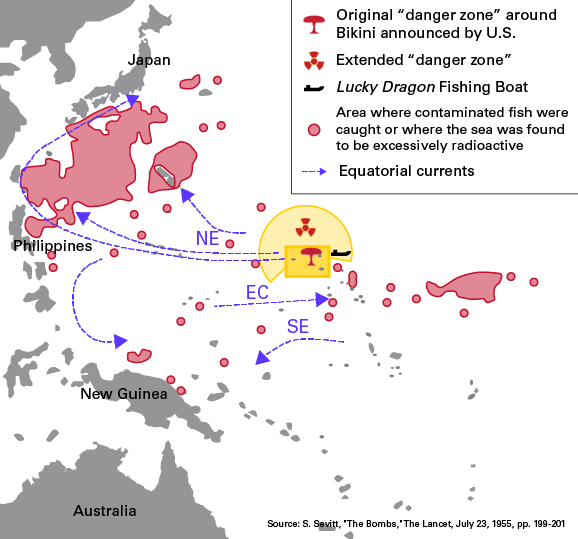 With inadequate safeties in place, radiation from the explosion injured a number of the crew and killed the radio operator on the Lucky Dragon #5 – a Japanese fishing boat that found itself too far inside the so called “danger zone.” Additionally, U.S. servicemen involved in the test where exposed to dangerous levels of radiation and forced to retreat to bunkers to wait for rescue. This incident is widely considered to be the United States’ worst radiological disaster. In 1962, the Cuban Missile Crisis opened the eyes of the world to the terror of nuclear war, but there were people across the globe who were already all too familiar with nuclear dangers. People in Japan and the Marshall Islands, those downwind from the nuclear test site in Nevada, the mothers who found radioactive material in their children’s milk: all understood in first person the health effects of nuclear explosions in the atmosphere. In 1963, about a decade after Castle Bravo, President John F. Kennedy called for a complete ban on nuclear explosive testing. This is not just a security issue; this is an issue of humanity, of health, of morality. We are the stewards of this Earth and we owe it to those who have fallen – to those who suffer still – to work together, one step at a time, until nuclear explosive testing is banned worldwide, getting us one step closer to our goal of the peace and security of a world without nuclear weapons. A peace and security that guarantees we never have to fear another missile crisis. We never have to fear the fallout of another test. We never have to fear that weapons on a hair-trigger can end civilization as we know it in thirty just minutes. Often lauded as awe-inspiring, the Castle Bravo test stands as an icon of those fears and a stark reminder of our inability to control these weapons. Sixty years later, the awe has faded and we are left with the human cost. As Gottemoeler said on March 1, 2014, we owe it to those who paid the price to find a better way forward to ensure we create a world where nuclear weapons can never be used again.